Wanna Win a Night Light From Me? I'm In Etsy's Halloween Gift Guide! My Beautiful Nephew...Rowan Avery Golden! I am slowly getting some of my vintage finds posted in my etsy shop www.lanisvintage.etsy.com. So far I have 2 things listed with lots more to come. 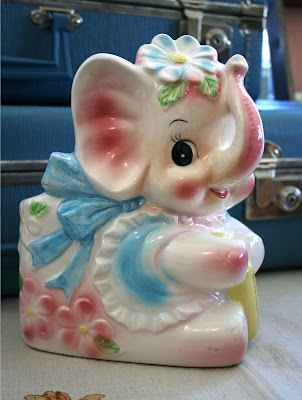 Isn't this elephant planter the CuTeSt? The SwEeTeSt little baby elephant planter! This is a vintage piece and it is in excellent condition! This planter measures 8" tall 6" long and 4" wide. The planter is ceramic and on the bottom says Japan 3204. I have this vintage card listed and I will be listing many more in the future! 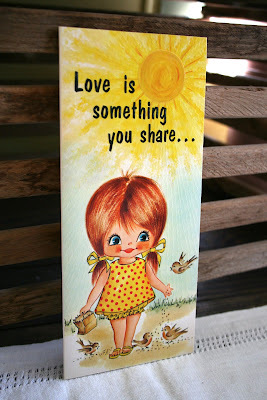 Love is something you share...not own! A vintage card that measures 3.75" wide X 8.5" tall. It is a "Caressable" TM and was made by Happy Time Greetings, Kingman, Kansas. It will come with a cordinating envelope.